On 10 February at the Patriarchal Cathedral of the Resurrection of Christ in Kiev the Head and the Father of Ukrainian Greek Catholic Church His Beatitude Sviatoslav and military Bishop Mykhaylo (Koltun) blessed the reanimobile for the military in the East of the country. 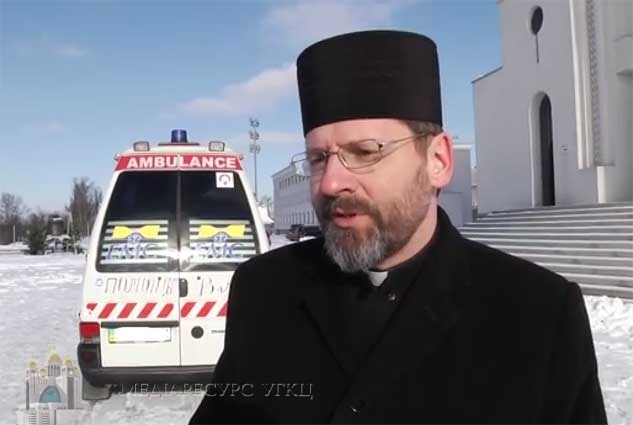 We, as a Church, strive to contribute to the protection of the lives of our troops, - noted His Beatitude Sviatoslav - However, the Church never deals with weapons and never makes certain steps to procure such things, which can be deadly. It has to do something that protects life". We have to add that to the military aid - reanimobile is equipped with four diesel generators: it was given by the donor deacon Petro Tokach. This reanimobile will allow timely and professionally provide medical care and transport those, who are seriously wounded. It should be noted that this vehicle performed its mission during the events at Maidan last year.